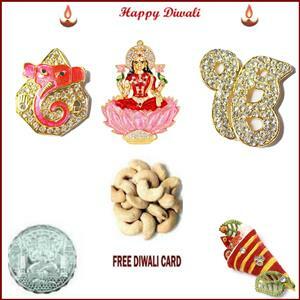 Send laxmi ganesh and ekomkar diamond studded metal figurines with 100 grams cashews for diwali. each order comes with a free silver plated coin, roli tikka and a handmade paper diwali card.. delivery only in canada. idol size: 5 cms each. please place your final order by october 15th, 9 am us central time for assured delivery on october 23rd, 2014.